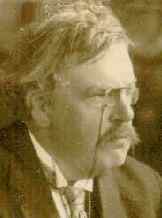 G.K. Chesterton, English journalist and author, was born in London on the 20th of May 1874. He came from a family of real estate agents and was educated at St Paul’s school, which he left in 1891 with the idea of studying art. But his natural bent was literary, and he devoted himself mainly to cultivating that means of expression, both in prose and verse; he did occasional reviewing, and had some experience in a publisher’s office. In 1900, having already produced a volume of clever poems, The Wild Knight, he took to journalism as a career, and became a regular contributor of signed articles to the Speaker and Daily News. He established himself from the first as a writer with a distinct personality, combative, unconventional and dogmatic. The republication of much of his work in a series of volumes (e.g. Twelve Types, Heretics, Orthodoxy) enhanced his reputation. His powers as a writer are best shown in his studies of Browning (in the English Men of Letters series) and of Dickens; but these were only rather more ambitious essays among a medley of characteristic utterances, ranging from fiction (including The Napoleon of Notting Hill) to fugitive verse, and from artistic criticism to discussions of ethics and religion. He is perhaps most famous for his novels The Napoleon of Notting Hill (1904), and The Man Who Was Thursday (1908), a witty allegory, and for a series of detective stories relating the adventures of Father Brown, a Roman Catholic sleuth. A collection of short stories detailing twelve cases solved by the detective Father Brown. The life lessons of Horne Fisher, the man who knew too much, told in eight stories of mystery and crime. A detective, Father Brown, solves mysteries in this twelve-story collection.